We were informed today by Bowser that the factory in China is moving ahead way faster than expected on the special run of the Canadian Pacific # 5500 model. The real engine, now on display at The Revelstoke Railway Museum is explained below. The Museum, Bowser, and Pacific Western Rail are working together to produce the model; a portion of the proceeds of each sale is to be donated to the Museum. We had expected the engine to be produced and coming in March of 2019. We will now expect to receive it in October of 2018. Therefore, final numbers for the production have been given to Bowser. Those numbers will leave six (6) of the non-sound version and twenty-four (24) of the sound version. Anyone has not ordered, should do so immediately to get one. Own a piece of Canadian Railroad History! In 1966 Canadian Pacific received the first of thirty-two (32) SD40s (the first batch) made in Canada by EMD in London Ontario. 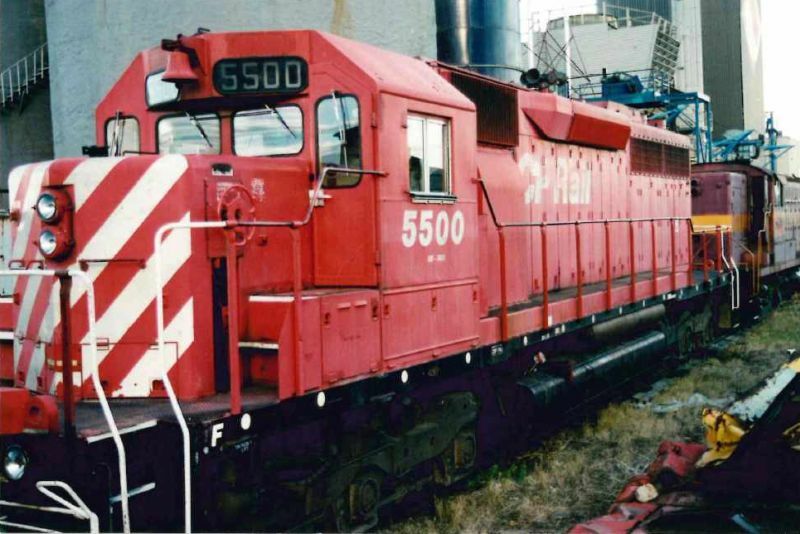 CP SD40 #5500 is preserved at the Revelstoke Railway Museum of Revelstoke, BC. 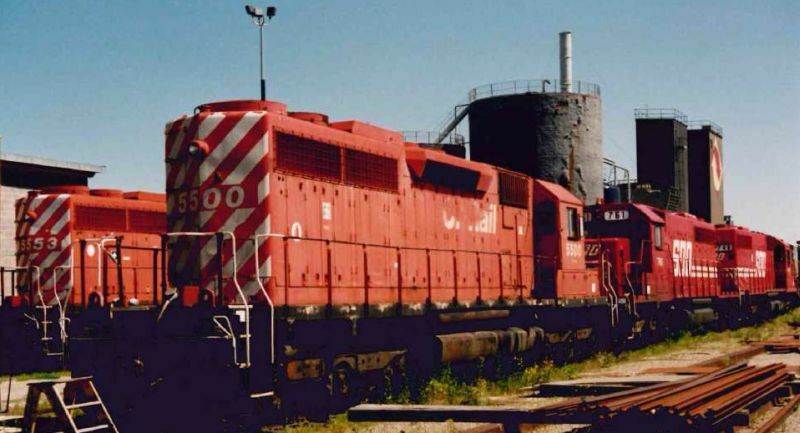 It was CP's first SD40, built in 1966 at GMD's London plant and was retired in 2001. The unit was donated to the museum in 2007. 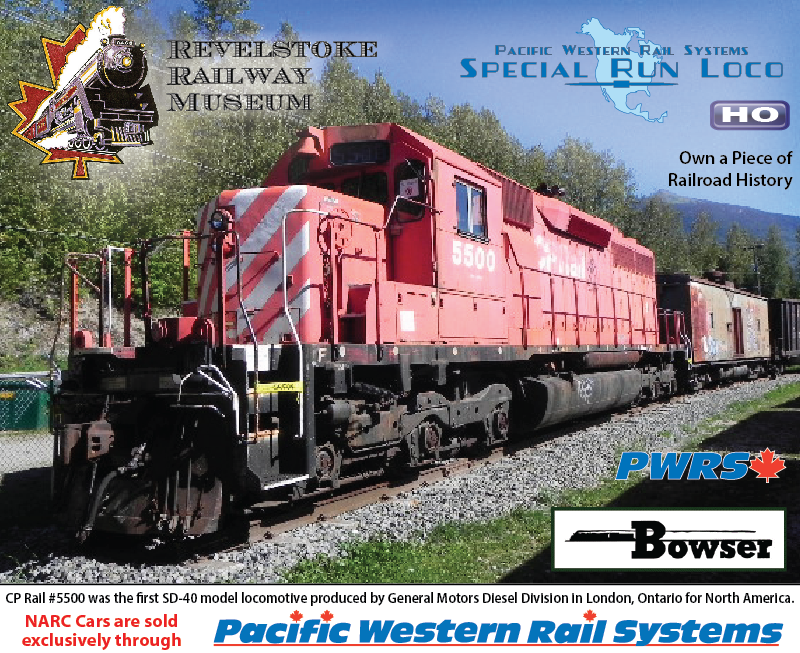 A short time ago, when Bowser announced their new run of SD40s, one of our customers called and noted: "isn't it too bad Bowser did not announce the CP 5500, since it is preserved in Revelstoke". Well, we contacted the Museum and Bowser and we are pleased to announce Bowser will produce a limited run of the CP 5500. PWRS will be selling it. Even better, next time you are travelling through the Canadian Rockies between Vancouver and Calgary we encourage you to drop in to visit the Museum. You could see the Museum exhibits and donate in person there too. The Museum also has on display a unique engine, the CPR 5468, one of only three remaining locomotives of the Mikado P-2k class with a wheel configuration of 2-8-2. We recommend if you are ever travelling by car between Vancouver and Calgary drop in and see the Museum. Upstairs is a beutiful Canadian Pacific HO Scale Layout worth seeing, the scenicing is incredible. We will produce a DC / DCC Ready version and a DCC and Sound version of the CP 5500. You will find some images below. Don't miss this opportunity to get this iconic diesel engine that worked so hard and for so many years!